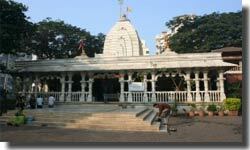 Mahalakshmi Temple in Mumbai is one amongst the oldest shrines in the city. It is Located on B. Desai Road at Breach Candy in Mumbai. 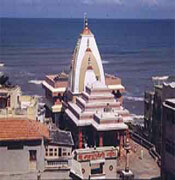 It is among the most visited temples of the city. The temple is renowned for its exclusive history and devoutness. The temple is sited at the seashore on the northern side of Malabar hills, Mahalakshmi temple can be reached easily by means of local transport in Mumbai. The waves of the Arabian Sea impart a perfect background to this religious shrine of Mahalakshmi. This famous temple is particularly dedicated to Mahalakshmi, who is the Goddess of wealth according to the Hindu mythology. The main doorway of the temple is been richly ornamented, leading to the temple complex. Nearing to the temple a flight of steps take to the shrine of the Goddess. 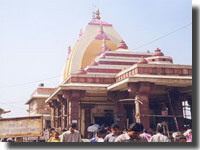 The main shrine of temple consists images of Goddess Mahalakshmi, Mahakali and Mahasaraswati. 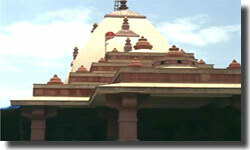 The temples's principal deity is Goddess Lakshmi, after whom the temple is named. Each and every image of the temple here is bejeweled with nose rings, gold bangles and pearl necklaces. The celestial appearance of these images of Goddesses, enhance the spiritual aura of the temple. It is regarded that the Goddess fulfills all the wishes of her true devotees. People with their firm conviction, come to the holy shrine of Mahalakshmi, to seek blessings from the Goddess. It is said that both Lords Shri Lakshmi and Shri Vishnu reside in the Karveer area eternally and shall not leave even at the time of Mahaprayakala. The temple is famous as it is one of the six sites of the Shakti, where devotees can get both fulfillments of desires as well as salvation from them. Mumbadevi Temple, Haji Ali Shrine, Towers of Silence, St Thomas' Cathedral, Kenneth Eliyahoo Synagogue, Mount Mary Church and Vajreshwari Temple are the other sites worth visiting in Mumbai. There is perfect accomodation facility here. Accesibility ia good as Kolhapur is well connected by rail and road with the major cities of India.Trains ply between Kolhapur and Mumbai, Bangalore, New Delhi and other important cities of Maharashtra like Pune,Sangli, Miraj. The city is also well connected by a road network. Through Airways - the city of Mumbai is a most important international doorway to India with international flights from major countries of the world. Air India and many other global air carriers operate regular flights to and via the city. Indian Airlines connects the city of Mumbai with nearly all tourist destinations of India. Through Railways -Mumbai city is the control center of the Central and Western Railways. Usual train services unite it with all main cities like Ahmedabad, Aurangabad, Bangalore, Bhopal, Kolkata, Delhi, Goa, Hyderabad, Jaipur, Chennai, Nagpur and Thiruvananthapuram. You can travel to Mumbai from any part of the country by direct train service. Through Roadways- there are good motorable roads with all major tourist centres which connect Mumbai. National Highways across the length and breadth of the country are great ways to go for the self-drive decision and head to Mumbai. If you aren't contented with driving through the ghats (mountain passes) take help from a local driver.